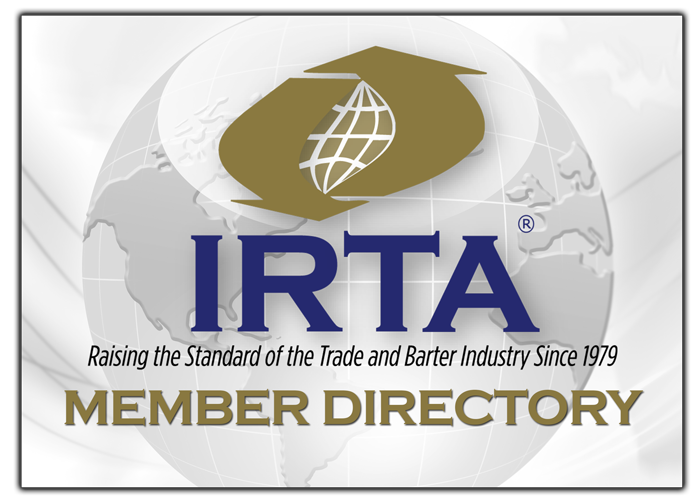 In 2015, both IRTA and UC have seen exceptional growth, continually improved financials and IRTA has reached important milestones as an advocate for the barter industry. IRTA and UC exceeded revenue goals and anticipate substantial growth this year. With the new customized software system, UC will continue to enhance collaboration and inter-trade opportunities for the barter industry. On behalf of the IRTA Board of Directors, I want to give special thanks to Ron Whitney, Patty Weston and the team at BPS Technology for their diligence and hard work to achieve the launch of the first software platform fully customized for UC. They will continue to improve and enhance the system and welcome your input! The IRTA website has been redesigned to modernize the site and maximize internet SEO. The new website will be released in January of 2016. Also, the IRTA Bylaws have been re-written and modernized to reflect current best practice and the final version will be presented for board approval in January, 2016. IRTA also assisted Connecticut legal counsel in obtaining a favorable ruling from the Connecticut Bar Association to allow CT attorneys to participate in barter exchanges subject to reasonable parameters. This issue has come up in other jurisdictions in recent years and IRTA has successfully made the case for legal firms to continue to participate as members in the barter industry. IRTA has continued to advocate for the barter industry on new state financial regulations concerning Money Transmitters as a result of the rise of cryptocurrencies and the potential impact on other complementary currencies including barter/trade currencies. We recently formed a “Money Transmitter Regulations Committee” with industry experts to monitor proposed crypto-currency regulations and intervene as necessary to protect the barter industry. The second major goal of the committee is to issue an IRTA Advisory Memo on crypto-currency/money transmitter matters to the industry in the first quarter of 2016. We need the assistance of members outside of the U.S. to advise us if they are facing similar financial regulations so that IRTA and the Committee can address issues that might impact you and the industry at large. The Complementary Economics Foundation (CEF) obtained its 501c3 tax exempt status from the IRS in July of 2015. The Foundations primary mission is to educate and build awareness of all sectors of the industry including; barter exchanges, corporate barter, countertrade and complementary currency systems. The foundation will officially launch in the first quarter of 2016 to help all sectors of our industry to grow and thrive. Contact CEF to make your cash or trade donations, www.ce-fdn.org. IRTA entered into a consulting agreement with the International Islamic Trade Finance Corporation (ITFC) to provide a report including recommendations for the development of a multi-tiered barter system for OIC countries. Meetings were held at the ITFC headquarters in November and again in December of 2015 in Jeddah, Saudi Arabia as part of phase one of the project. The report was delivered by IRTA to the ITFC on December 22nd, 2015. We look forward to working further with the ITFC to support the establishment of trade initiatives in the region. The Strategic Planning & Business Development Department of the Government of Dubai has expressed similar interest so momentum is building. IRTA has provided them with a comprehensive report on “Barter Industry Sectors & Supporting Reference Materials” and is coordinating a visit to the U.S. for March of 2016. Our goals in 2016 are to continue to grow the memberships of IRTA and UC and to materialize the opportunities in front of us that will improve and expand our great industry. The Board of Directors will meet in late March for its annual two day planning meeting to evaluate and set the next steps and goals for IRTA and UC. Stay tuned for updates and upcoming news about the 2016 convention. We are working on new and more diversified seminar and workshop content for the next convention. Your input and participation is always appreciated. Best wishes for success in the New Year!